For Halloween I thought it would be good to share some scary stories, you in?? I know you will be when I tell you which authors are!! :) I have gotten a few AMAZING authors to tell us their scariest memory or story. Excited yet?? YEP me to! You must be a follower of this blog to enter. You must share your scariest memory or story. To enter leave a comment on this post with your email address & memory or story so I can contact you if your winner. 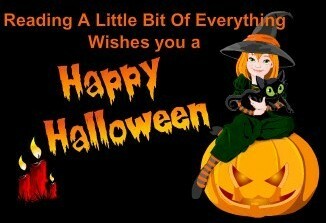 P.S The scariest story or memory wins!! This giveaway will stay open until Halloween midnight UK Time. Winner be announced on Tuesday 1st November. Mine: This happened to me years ago it was near where I used to live﻿ (I'm not gonna tell you) I was out with my sister and a few friends, it was Halloween night (I think) We were all standing out side one of my friends house when we saw this car drive past really slowly. . . There was a young man driving and there was another person in the passenger seat. They seemed to be all dressed in black so I didn't see if it was a man or a women I'm guessing man. Anyways the car stopped and the car light went on. My friends and I all stood and watched to see what happened next. The man in black turned round . . . they were wearing a Scream mask! He tilted his head from right to left then held up in his hand a knife . . . with the knife in his hand he started moving it so it was like he was stabbing someone!!! All my friends screamed and tried to rush into her house while I stood mesmerized!! I watched to see what they would do but they just sped off in there car! I've been scared of Scream ever since. My family and friends can't even mention it and I also have nightmares sometimes too. . .
Katie M John: Happy Halloween everybody. Kerry invited me to share a spooky tale or two and so I thought I would share the following experiences. There have been several others but these are the ones which have really stayed with me. When I was about eight years old, my parents booked for us to stay in an old Rectory in Dorset. It was a really beautiful place, kind of medieval looking with roses around the door. It was quite old and run down on the inside; not much modernisation had taken place. It was still the old iron beds and patchwork covers. On the first night there I remember being woken up by the sound of a strange thudding, but my parents reassured me it was the old central heating system - I wasn't overly convinced. I was even less convinced the next morning when I walked down the stairs (they were a half turn set of stairs with a landing half way down) to see a dense dark shadow, about six foot tall and wearing a hat. I remember being quite distressed and my mum telling me I was imagining it. Years later she told me that although she hadn't said so at the time, she saw the same shadowy figure several times on the holiday. When she did a bit more digging around she discovered that other guests had seen the figure and they believed it was the ghost of a vicar who fell down the stairs and broke his neck. It would certainly explain the strange bumps in the night. When I left university I worked in an old bookshop in Gloucester. I'd only been there a couple of days when I kept smelling really strong wafts of lavender. It was strange because it would often come when we were at our quietest and literally felt as if somebody had just walked by. Their was an antiquarian bookstore on the floor above and very often I'd hear a thump and then later find books on the floor. The third story of the bookshop was disused and rarely visited, but very often as I came back from the staffroom, I would hear the soft steps of slippered feet on the stairs; when you put your hand out it would be like literally touching a cold metal door of air. Kerry Sparks: It was Halloween night. I was in college, coming home from a Halloween party. It was dark and there were handfuls of students walking about. One person stood out from the rest. He was wearing a Scream mask and a dark black robe paired with midnight pants. I saw him for a few seconds then he disappeared behind a tree. I got into my car and then I went to put my key in the ignition. Suddenly, I felt someone looking inside the car. I looked at the front windshield and BAM! there was the Scream mask plastered across the windshield. AGHH! I jumped. I quickly started the car and honked the horn at him, and he lurked away. WOW!!! I'm scared! What did you think of our scary stories and memories?? We told you ours. . . Now we want to know yours . . .
P.S . . Are you 100% Positive you locked and closed up all your windows and doors tonight?? Why don't you have another check just to be on the safe side. . . oh and don't forget to look under your bed!! 4. Then add your link below. "You have been viciously attacked, but then saved by the tall, dark vampire of your dreams; however, he has had to change you into one of the blood sucking denziens of the night to save your life. After realizing that your favourite snack is now going to be a sip of O negative, what food do you begin to think you will lose your immortality for?" What's your dirty little Secret?? An Excerpt from Dale Mayers fab new read Tuesday's Child!! Dale Mayer is a prolific multi-published writer. 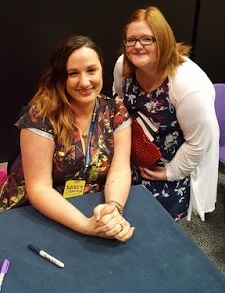 She's best known for her romantic suspense novel that was one of the final four in the Kensington Brava/Romantic Times contest this last year. Besides her romantic suspense/thrillers, Dale also writes paranormal romance and crossover young adult books in several different genres. To go with her fiction, she also writes nonfiction in many different fields with books available on resume writing, companion gardening and the US mortgage system. She has recently published her ebook format. What she doesn’t want…is exactly what he needs. Shunned and ridiculed all her life for something she can’t control, Samantha Blair hides her psychic abilities and lives on the fringes of society. Against her will, however, she’s tapped into a killer—or rather, his victims. Each woman’s murder, blow-by-blow, ravages her mind until their death releases her back to her body. Sam knows she must go to the authorities, but will the rugged, no-nonsense detective in charge of tracking down the killer believe her? Detective Brandt Sutherland only trusts hard evidence, yet Sam’s visions offer clues he needs to catch a killer. The more he learns about her incredible abilities, however, the clearer it becomes that Sam’s visions have put her in the killer’s line of fire. 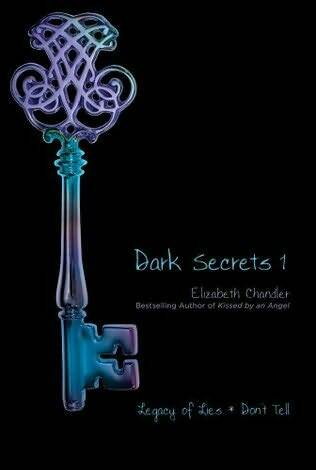 Now Brandt must save her from something he cannot see or understand…and risk losing his heart in the process. As danger and desire collide, passion raises the stakes in a game Sam and Brandt don’t dare lose. Lying in bed that night, Sam couldn’t sleep, her overwrought mind refused to let up. The tantalizing possibility that she was meant to do something with this gift worried the frayed edges of her mind. Depressed and unsettled she fell into a fitful sleep, her dreams dark and disjointed pieces of past visions. Screams jarred her from a deep sleep. Confusion turned to fear when Sam realized the horrific sounds were coming from her own mouth. Even worse, she had no idea where she was. Terror overwhelmed her. Her fingers spasmed in a death grip around a strange steering wheel as the car she drove careened further out of control. Still trying to toss off the remnants of sleep, Sam yanked hard on the wheel in a futile attempt to turn it. The mid-sized car plowed through a steel barricade to hang suspended in midair before plummeting to the rocks below. Screams ripped from her throat and she reefed on the useless steering wheel, helpless to stop the deadly impact. Her foot pounded on useless brakes. The front grill of the car crumpled and metal buckled upward. The car smashed into the first of the rocks below, snapping her forward into the windshield. Agonizing pain shattered her spine. Grinding metal, exploding glass and continuous crunching sounds filled the air as first the bumper flew off, then the rear window shattered outward. Twisted metal ripped and groaned, flying to land beside the crash site. The car tumbled, smashed on a huge rock, careened to the left and flipped end over end before coming to a hard landing on its wheels at the bottom of the cliff. Sam trembled. Shock and pain pulsed through her veins even as her blood dripped out one beat at a time onto the shredded seat beside her. God, she didn’t want to die. She wanted to live. Please, dear God. Blood streamed over her face, her spine…where a shearing heat set off continuous stabbing pain. The steering wheel jammed into her ribs. The front dash had crumpled into a mess of twisted steel and plastic, the famous Mercedes emblem now hung drunk in mid air over the remains of the once beautiful cream leather seats. Sam couldn’t feel her right arm. And wished she couldn’t feel her left. She closed her eyes, willing away the image of bone shards that had sliced through her sweater, a few loose strands of wool clinging to the ends. Heart wrenching sobs poured from her throat, tears coated her cheeks. She was alone. And dying. A brilliant flash of light engulfed the car as the fuel from the pierced gas line flashed into flames. Heat seared her lungs and scorched her hair, the strands melting against the inside of her car window. Panicked, she screamed as flames licked at her feet, burning, and cooking the flesh right off her bones. A voice whispered through the blackness of her mind, so odd, so different it caught her attention. She strained to hear the words. "Let go. It’s time to let go." Sam stared through the flames, stunned. Let go of what? She couldn’t hear over the roaring fire and could barely see, but knowing that someone was there stirred her survival instinct, and she started fighting against the seatbelt jammed at her side. She was saved. Just another minute and they’d open the door and pull her free. She’d be fine. "Please hurry," she cried out. "Let go. You don’t need to be in there. Let it all go, and come with me." She peered through the golden orange windshield to see a strange male face peering at her through the flames. "I want to, damn it. Can’t you see I’m trapped?" she screamed, her vocals crisping in the heat. "Release yourself. Come with me. Say yes." The pain hit a crescendo. She twisted against it, hearing her spine splinter. The car seat melted into her skin. So much pain, she couldn’t breathe. Blackness crowded into her mind, blessed quiet, soothing darkness. She reached for it. "Let it go. You don’t need to go through this. Hurry." She started. Why wasn’t he opening the door or getting others to help? He should be trying to save her. Shouldn’t he? Sam, so confused and so tired, she could barely feel the pain overtaking her body. Where had he gone? She tried to concentrate. His face was now only a vague outline that rippled with the heat waves. A soft smile played at the corner of his mouth. The flames burned around him, weird as they centered him in the warm glow. She wanted to be with him. To live. Dazed and on the brink of death, Sam focused on the hand reaching for her. She struggled to raise the charred piece of flesh that had been her arm and reached out to grasp his. Overwhelmed, cries of relief escaped. She turned to hug her savior, her head just reaching his shoulder. He stood beside her, the same radiant beaming look on his face. His blond hair glowed, and he had the brightest teeth. She sighed. This beautiful man pointed to her right arm. Confused, Sam glanced down at her burned arm, realizing she could feel none of her injuries. Just like her other one, her broken arm had miraculously healed – whole, smooth and soft. Her skin hadn’t looked this good in ten years. She spun around to find a massive fireball below. What the hell? She had to be dead. But instead of the horror or shock, she expected to feel, she felt good. In fact, she felt great. She turned to the ever-smiling stranger. Sam didn’t know why he’d called her that, but she bloomed under his loving gaze. Honestly, she was so damned grateful to be out of the car, she let him get away with it. Holding hands, they floated higher into the cloudless blue sky. Then when the crash site below had become a tiny speck, Sam felt a hard flick on her arm and the words, "Thanks, but I can take it from here." Ohhh Doesn't sound amazing?? What do you think of it?? They might be perfect together but in a city of eight million people, will they ever find each other? Jessie Hearts NYC is an amazingly written novel about Love, New York, Friendship, Coincidences, and The Empire State Buliding. What's not to love about Jessie Hearts NYC? I loved reading every page of this book and you would to. We get to meet alot of characters in this book and that makes it all the more interesting. The book itself is obviously based Jessie and Finn. But with them comes there families, friends and their own stories. Jessie is in New York visiting her mum (Natalie) she has also taken her bestfriend with her (Emma) along for the journey. We see alot of strain between Natalie and Jessie which in understanding on both there halfs. We then get to meet Ben which is Jessie's crush (kind of) and Jessie finds out in an embarressing way that he is Natalie's bouyfriend. Her and Emma then flee to a hotel and go up to the roof where Finn is holding his 18th Birthday. That's how they first meet. We've alreadt met Finn thought and his bestfriend (Scott) and the girl Finn's in love with (Sam) which is Scott's girlfriend. After that Finn and Jessie keep meeting coincidently. Later on in the book Jessie's dad (John) and his boyfriend (Rhys) comes into the book and announces some new to Jessie. (I won't tell you as I don't want to ruin the surprise). Anyways, before I babble on about this book for hours which btw I could do as it's amazing I'll stop. Just wnter the comptition below orr buy a copy of this book. You will NOT be disappointed. ~ First things first, Can you tell readers abit about yourself as well as Jessie <3 NYC? I can! I've been writing for years and had my first YA novel published in 2010 (Della Says: OMG!). My second, Jessie Hearts NYC, came out in July this year. I live in Lancashire with my husband and two sons and I'm obsessed with Twitter. 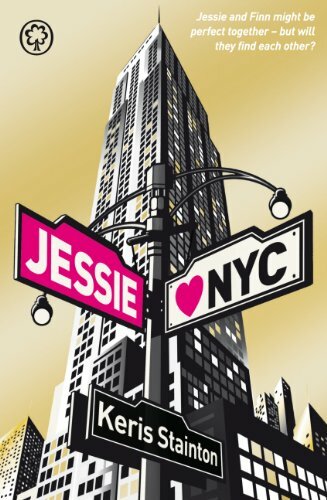 ~ I loved Jessie <3 NYC as it's such an amazing book, Can you tell us where you got your inspiration from? Thank you so much! New York was my main inspiration. I absolutely love it there and I've always wanted to write a book set there. Then I was listening to a song by Jason Mraz called If It Kills Me - it's about a boy who's in love with his best friend's girlfriend and I started thinking about how stressful that would be (but it's also quite a romantic idea, don't you think? Someone being secretly in love with someone they can't have) and Finn popped into my head, standing in Times Square, wearing a tuxedo, holding a bunch of red roses and trying to flag down a cab! I do. I think it's hard not to and that authors who say they don't are probably kidding themselves! None of the characters are exactly like me, but they've all got aspects of me, definitely. ~ Why should people read Jessie <3 NYC? ~ I love the Gold backround on your book with New York on the front cover who designed your cover? The artwork was done by an illustrator named Mike Lemanski, who is amazing. I'd actually seen and loved his illustrations before (like this one http://www.mikelemanski.co.uk/?p=484) so I was thrilled when I found out he'd done the cover. I actually started trying to write a novel in the mid-90s, but it took me until 2005 to finally finish one. That one was a novel for young adults called FORGET ME NOT. I sent it out to agents and was luckily enough to sign with my agent quite quickly, but then it took quite a while to find a publisher. I signed with Orchard Books in Summer 2008, I think it was. They decided that FORGET ME NOT wasn't right for the first book and so I wrote DELLA SAYS: OMG! and then they asked me to write something else, which turned out to be JESSIE HEARTS NYC. So it wasn't a particularly difficult journey, but it was quite a slow one with a bit of an odd speed-bump on the way! ~ Can you tell us what a normal writing day is like for you? Three days a week, I take my 7-year-old son to school and then come home and play with my 2-year-old until about 11 when he goes for a sleep and then I write like a mad thing until he wakes up at about 1.30. Or I *should* write like a mad thing, but mainly I faff about online and on Twitter until I start panicking at about 1 o'clock. The other two days, my 2-year-old, Joe, has preschool and then goes to his grandparents' for the afternoon, so I have from 9.30 til 3 to write. Again, I probably start writing in a panic at about 2.30. When I've got a deadline, though, I'll write in the evenings too. ~ Do you have a specific writing style? I think I almost certainly have, but I wouldn't know how to describe it. I try to be chatty and straightforward without being patronising. Hope I've succeeded so far. ~ Are your currently working on anything new atm? If so, can you tell us anything about it? ~ There are alot of aspiring authors out there atm, Do you have any advice for them? The best advise is really to read as much as you can. And don't worry about trends in publishing - write whatever you want to write. If you're passionate about it, it will come through. ~ Night Owl or Early Bird?Early bird. I start falling asleep at about 9.30pm. ~ Author?I LOVE Meg Cabot. I'm also watching Would I Lie to You on the iPlayer as I'm writing this. I love David Mitchell. I'd like to give a big massive thanks to Keris for taking the time out and answering the above questions. I really means to me and I'm sure it does to you readers to. I'm giving away one copy of Jessie Hearts NYC to one lucky reader. You MUST be a GFC follower of Reading A Little Bit Of everything to Enter. Leave a comment below with your email address so I will be able to contact you if you're the winner. I think of you, then. I think of you every day. But usually in the quietest part of the morning, or the darkest part of the night. Not when my boyfriend of two years has just proposed. I look up at Richard with his hopeful eyes. 'Lily?' he prompts. Ten years ago when Lily was just sixteen, she fell in love with someone she really shouldn't have fallen in love with. Now, living in Sydney and engaged to another man, she can't forget the one that got away. Then her past comes back to haunt her, and she has to make a decision that will break her heart - and the heart of at least one of the men who love her. It's another Paige Toon book I mean what's not to love? Every book of Paige Toon's I love. Pictures of Lily though I especially loved the way she wrote at the start that Lily was 16. It just shows you (even though it is a book) that you never forget your first love and that their love was real. So instead of me babbling I'm not going to say the usual stuff I always say in any Paige Toon Review but you really do need to go and read this book. It is amazing!!! 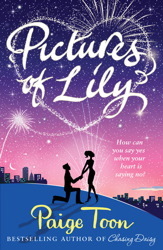 Have you read Pictures of Lily?? What did you think? ?